Thanks to Tyler Green‘s vision and organization, a slew of art bloggers are posting about the Detroit art community today in an effort to halt the rumored sale of the DIA art collection. According to press accounts, the collection might be worth as much as $2 billion. If they sold the collection and managed the proceeds like an endowment (the way a college like Williams does) that would provide annual funds of about $90 to $100 million per year. How does that compare to the museum’s contributions to the local economy? The DIA has a budget of about $57 million and brings in about 400,000 visitors per year. We’ll be very conservative and assume that only 35% of the visitors come from outside Wayne County (where Detroit is) and only give them credit for the local spending of the outside visitors. Putting those figures into our web application produces an estimate that the DIA contributes $103,631,976 each year to the local economy, and directly or indirectly supports 877 jobs in the city. Therefore the contribution of the working museum is greater than the annual earnings that could be obtained by selling off the collection. Selling the art collection to help bond holders recover 25 cents on the dollar instead of 20 cents on the dollar is complete foolishness. It makes as much sense as selling off all the schools in the city, or tearing out the power lines that distribute electricity to homes so that the scrap copper can be sold. Schools and the local electric grid would never be broken up and sold because they are part of what makes a city a “city”. The same observation applies with equal force to a world-class museum and its collection. Well put, Dr. Sheppard–thank you. Let’s hope Creative Communities: Art Works in Economic Development becomes required reading for all town planners and government officials in these challenging economic times. 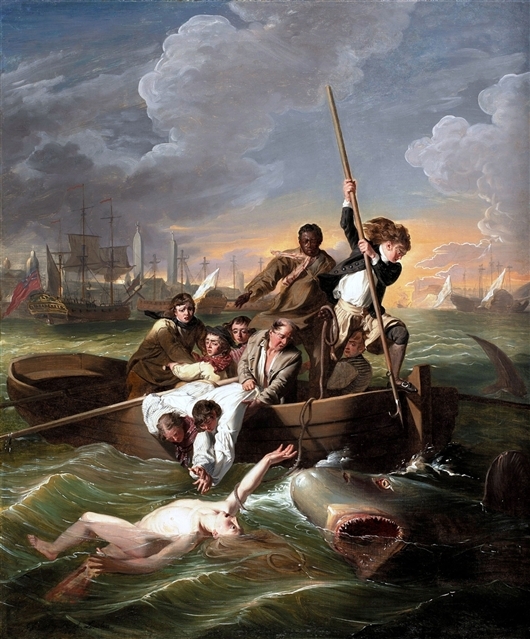 Image at top: John Singleton Copley, Watson and the Shark, 1777, oil on canvas, 36 x 30 1/2 inches. Provenance: Noel Desanfans, before 1786 Sale, Christie’s, London, April 8, 1786, lot 396 W. Goddard, by 1791 Sale, Christie’s, February 5, 1791, lot 73, sold to Green G. P. Anderson, London W. P. Hunter, London, ca. 1850 M. Knoedler Co., London, 1946 DIA in 1946. Founders Society Purchase, Dexter M. Ferry, Jr. Fund. It's depressing that we have to defend an amazing art institution in economic terms, but I greatly appreciate this piece, and I can only hope it gently persuades those who look at art as an asset. Thank you!